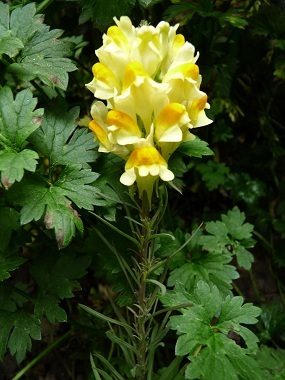 Yellow toadflax was first introduced to North America by a Welsh Quaker as an ornamental plant. In addition to its beauty, it was also used for creating yellow dye, and as a lotion to help heal insect bites. This is a short-lived perennial that some people consider invasive while others welcome the beauty of this medicinal plant. Interestingly, when boiled in milk, the plant is said to yield an excellent fly poison; and an old country custom in parts of Sweden is to leave this milk infusion where flies are troublesome. Distinguishing Features: From perennial and creeping rhizomes, the yellow toadflax sends up several slender stems, erect and often branched. Once in bloom, they resemble a small version of the snapdragon. 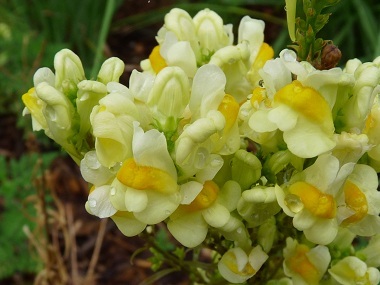 Flowers: The yellow toadflax flower has a distinct snapdragon-like flower that is yellow (or even a pale cream at times depending on growing conditions) with a “bearded” orange throat. They grow to about 2.5 cm. long. The flowers grow in a dense terminal elongated cluster and bloom between July and October. The mouth of the flower is completely closed and never opens until a bee forces it open. Fields of Nutrition has medicinal benefits and vitamin/mineral content of Yellow Toadflax. Leaves: Yellow toadflax has numerous pale green, narrow leaves that are pointed at both ends. Leaves are about 6-7 centimetres long and grow alternately on the stem but may appear to be opposite. Height: This wild edible weed often grows 30 to 60 centimetres tall. Habitat: Although this plant prefers well-drained, coarse-textured soils that can range from sandy loams to heavy clay to coarse gravels, it actually grows better when in moist, fertile soils. They grow in fields, along side of roads, waste areas and they can even make their way into people’s gardens. Edible parts: The young shoots can be cooked; as well the flowers and leaves can be consumed dried or fresh. Use with caution, consume only small amounts at a time. When fresh, yellow toadflax has a peculiar, heavy, disagreeable smell which dissipates by drying. It has a weakly saline, bitter and slightly acrid taste. Other name: Butter and Eggs. Similar plants: Dalmatian Toadflax, Snapdragon.